During last year's basketball season, I spent a lot of time talking about Manny Harris and John Beilein, and neither for particularly positive reasons. I had grown tired of Manny's clear indifference toward the team and Beilein's failing strategies. And as we sit through another losing season from the basketball team, it's time to start wondering when Dave Brandon's hammer will come down on Beilein. I have long bemoaned the death of the John Beilein-led Wolverines, but I can think of no clearer symbol of, well, utter failure than in his fourth year to have only 1/3 of the team entering the season with any game experience at all, one of whom averaged only 5.5 minutes per game in his freshman season--and let's note that a) Beilein isn't recruiting one-and-dones; b) he didn't necessarily take over a program chocked full of upper classmen; and c) it's not like the team succeeded last year and graduated their talent a la UNC 2009. As Dylan at UMHoops says, this is a rebuilding year, but is that even acceptable in the fourth year of the program? The four game-experienced players Michigan has returning combined for 30.59% of the team's scoring last year... The rest of Michigan's team now is inexperienced and undersized (mostly), and is going find themselves led by Novak and Douglass as the team's returning "veterans". I trust Beilein, or at least I'm trying to. He took the team to the Tournament in his second season and should be awarded some sort of leniency for that, but it's difficult not to look at the current state of the program and think it's headed downward. One bad break (Ben Cronin) and one early departure (Manny) should not send an entire program into a tailspin of crippling youth and, let's face it, mediocre players, but they have. If Rich Rodriguez didn't exist, Beilein would be feeling a lot more heat for this, but Michigan will always and forever be a football school. I'm about at the end of my rope with Beilein. 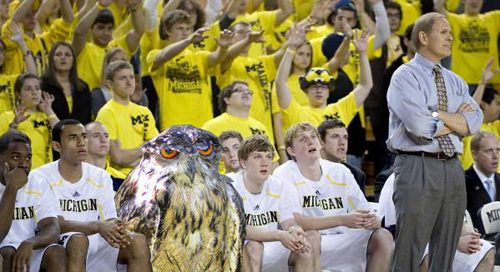 If we don't see anything this year, you can expect me to be leading the torch and pitchfork crew into Crisler. I, like most of the Michigan blogosphere, was pleasantly surprised with the progress the team appeared to make early in the season. Darius Morris was turning into an outstanding point guard, the young players on the team we overachieving, and most surprisingly, Michigan's man-to-man defense was unflappable. But demoralizing losses to Northwestern (by 14) and Indiana (by 19) and it becomes clear that, though Michigan's early success wasn't a mirage, it was largely the function of a weaker schedule. People will point to close losses to Syracuse, Ohio State, and Purdue as signs of progress, but college basketball is a game that offers a lot of parity--because of a long shot clock and a shortened game, there are less opportunities for both teams to score resulting in lower scoring games and lower differentials. And where there is parity, there are bound to be close games. In Amaker's final year, Michigan had a four-point loss to #1 Ohio State. In the 03-04 season, Michigan had a close loss to a ranked MSU team and a win over #17 NC State. Even Indiana gave Minnesota and Wisconsin runs for their money in the last few weeks. The point is, close losses to good programs are not something to build your program on. The more telling games are blowouts to UTEP and Indiana. Michigan is still a team that's capable of losing to bad teams on a frequent basis, but that also has the talent to play with (and occasionally upset) a high-ranked team. This is what Beilein has built in his fourth year. Others will point to Michigan's tournament appearance as a testament to his skills. However, Beilein got the team there on the backs of Amaker's players (right). It's tough to say argue that Michigan would've been as successful without Novak, Douglass, Grady, and Lucas-Perry (the only real contributors to that team), but the majority of the 2008-09 team's production came from Amaker players. There's obviously something to be said for turning them into a NCAA Tournament team--though Amaker never had Manny Harris on campus--it's also important to note that Beilein's far-and-away most successful season came primarily from another coach's players. Since that season, and the subsequent graduation/flight of Amaker's players, we've watched the team make a precipitous drop down the Big Ten and once again out of the national spotlight. Beilein has almost completely abandoned the schemes and styles that made him a successful coach to begin with (1-3-1 defense and a three-point shooting offense) because the players he recruited either can't shoot as well as he had hoped or don't understand the defense under which they're playing (or both). So as Michigan plummets toward the bottom of the Big Ten, I have to wonder how much longer people are going to endure at best mediocrity and at worst utter failure. What Dave Brandon does in the coming months will be interesting. During the Rich Rodriguez debacle, he said that with all coaches, he would wait until the end of the season and judge things accordingly. He then threw his support behind Beilein before the season had started. But if Rodriguez gets the axe after only three years with a roster that's comparably young to the basketball team, you'd have to imagine that Beilein is also seriously on the hot seat. And he doesn't have one of the nation's best offenses (or defenses) to fall back on. Whose expectations, though? Mine were the bottom of the Big Ten. This team is playing precisely as I thought they would. "And in terms of next year? Well, a weak recruiting class and the loss of all experienced big men is going to mean another dip in the Big Ten standings. John Beilein sure is lucky RichRod is around. Without him, people might be paying a bit more attention to a basketball team that's quickly headed toward the cellar." Even if those expectations are unusually negative or not indicative of most peoples' feelings, expectations in a coach's fourth year need to be higher than NIT bid. Dave Brandon is full of it. The Rodriguez firing wasn't about results, it was about culture and perception. Results could have overriden that, but they didn't. Beilein doesn't have any perception or culture problems, so he gets more leeway with results. If you want to pretend Rodriguez and Beilein are going to be held to the same standard, you're ignoring reality. Anyway, I'd rather our treatment of RR be an exception than the rule. Everyone is better off letting go of that ugly episode. Learn lessons from it and most importantly don't repeat the same mistakes. Beilein deserves time; time that Rodriguez also deserved but didn't get. All that said, I think you're right to be critical of where Beilein is at. The biggest failing has been recruiting. There were some near misses with Benzig, Prather, Ziegler and others that may have helped a great deal, but its still not enough. Michigan is simply not recruiting any top 50 players and that rarely leads to consistent success. You need Manny Harris and Courtney Sims level talents. You need to find a way to work them in. Still, theres reasons for optimism. Next year's team returns intact. Experience can make up for talent. For the first time next season Beilein will have a senior class of his players, returning experience across the lineup, and a respectable depth chart of talented players at each position. At last, role-players like Vogrich, Christian, and McLimans can be used properly (sparingly) instead of being relied upon. It makes no sense to transition away for Beilein just as his roster matures. Since his first recruiting class (which was understandably weak), Beilein seems to have ramped up from '09 (Morris) to '10 (Smotrycz and Hardaway) to '11 (Bundridge and Burke) in terms of getting top 100 players. The reaches like Cronin, Vogrich, McLimans, and Christian are becoming less common. We're not Kentucky, but the trend is encouraging. Progress has been slower than you'd want, but the compass seems pointed in the right direction. I'd say Beilein deserves 2 more years to show he can take his players and mold them into a roster that consistently makes the tournament and is in the upper-half of the B10 every season. I agree with basically all of that. I'd still like to see more progress now, but I think next year is probably the make or break season. By that time, he will have a full recruiting class of his own players with senior starters/contributors Novak and Douglass (or players that beat them out), as well as a junior Morris. If Michigan isn't seriously competing for the Big Ten title by then, it's going to be time to look elsewhere or at least see what's out there. We'd all like it to be better now, obviously. The question is the best way to move forward and the overwhelming feeling is that Beilein remains the right guy to take the program forward. Looking back over the roster the one weakness that is immediately evident is that Morgan/Horford/Smotrycz remains a pretty weak front-court rotation. Its probably too late for recruiting to fill the void in 2011, so that means more Novak. Another big man seems like the greatest recruiting need moving forward. agaerig is right about expectations. This was the same thing that people argued about Rodriguez, especially related to the defense. "I know at the start of the season I expected this, but I got my hopes up in non-conference, so now...fire the coach"
As I said last year, if Michigan didn't show improvement this year, it'll be time to look elsewhere. I expected this was how the team would play, but was willing to give Beilein the benefit of the doubt and see what he could do. This looks like it might be another year of regression (which we all mostly expected with the loss of Harris and Sims). I guess the question is: When can we reasonably expect this team to compete for a Big Ten title? Maybe next year if everyone continues to develop? The year after that? When does Beilein's recruiting make the next leap, because his coaching seems to have stagnated. If this same logic was applied to Rodriguez you'd jump all over it. Actually it already was, and you already did. His coaching seems to have stagnated? I don't see how you can say that when talent and age have declined yet performance has been maintained. Michigan hasn't had a winning record in the Big 10 all along. Its a bad start this year but they can still get in the neighborhood of wins they've been at for the last few years (8, 5, 9, 7). You can point to NIT vs NCAA or whatever, but this program has been hovering around as a below-average Big10 team since Fisher left. When does he make a leap in recruiting? Probably never. What you want to see is continued improvement to a point where Michigan is grabbing some top 50 players to go with the top 100 guys they've started to routinely get. The criteria should be improvement. If Beilein backslides and the program arc looks to be trending backward, then fine - fire the guy. Progress is the primary criteria. Measureing just by wins and losses is thick-skulled. You can't gripe that people didn't give Rodriguez time to see where his progress was leading and say they expect too much too soon given the circumstances, then do the exact same thing to Beilein. Thats being hypocritical. Yes and no re: RR vs. Beilein. RR showed tangible improvements each year in wins and on the offensive side of the ball. The defense showed otherwise. Beilein already has one year more at Michigan than RR was given and has shown one year of improvement followed by back-to-back years of regression (unless this year suddenly turns around). I'm not really calling for Beilein's head yet, but I a) wouldn't be surprised or upset if he was gone at year's end and b) think it's time to start looking around for other options. I don't know the basketball coaching landscape well, but if there are stud recruiters out there, I'd love to give him the reigns of the program. One great recruiting class can turn a basketball team into a consistent power. It's the nature of the game. They will never compete for a Big Ten title as long as the Athletic Director insists on cleanliness. 90% of a cbb head coach's job is talent acquisition, and 1) recruiting the very best talent usually involves grey areas or worse; 2) Michigan's basketball brand is completely dead and has been for years; 3) the amount of talent in Michigan is nowhere near where it was 25 years ago; and 4) Michigan's competing in-state with a program that's been to 3 Final Fours in the past 6 years. How many hoops-interested kids borm after 1990 in Michigan are Michigan fans? Not many, imo. To overcome that quickly requires sketchy, grey area recruiting like Frank Martin or Bob Huggins engage in. Replacing John Beilein with a different version of John Beilein and forcing him to wear the same pointless handcuffs will result in the same outcome. Anonymous above makes some good points. Michigan's bball success in the last 30 years has definite sketchiness associated with it. We know the story of Webber, Traylor, and Bullock and there were definite rumblings about the Tarpley era. There are basically two programs (Duke and MSU) I can think of that recruit top level guys, make Final Fours, and are squeeky clean. Unfortunately, one of them is not only in your recruiting region, but in your home state. That is going to be tough to overcome. I have questions about some of the things that Beiliein does (not adjusting to Udoh, running Kelvin Grady off the team), but I think conceptually, he's the perfect guy for this program at this point. Expecting BT titles now is just not realistic. Like the guy above said, get above .500 in the conference first, then we'll talk about titles. If Beilien can get this program to the point that it makes the tournament 50% of the time, has a seven man rotation of top 100 guys (a top 50 here and there would be nice) and becomes a decent brand again, he will have succeeded. I expect 5-7 years of that before he retires, and then I think the next guy in will be the one that wins titles. If in two years the team is not a real tourney threat, then I'd be open to making a change. You can turn a program around very quickly in college hoops, but I'm not sure you can do it on the up and up. FWIW, I think Amaker had the potential to do what I mentioned above, but his recruiting completely fell off the table after his first two classes and his player development was, uh, lacking. I've got a hunch that JB's chances of sticking around just went up a bunch.